Don't tell Hollywood I said this, but chopping the final novel of the Hunger Games trilogy into two films might be the best thing that could have happened to this franchise. I mean, it didn't work for Harry Potter — the first Deathly Hallows film was terrible — and Peter Jackson is already two-thirds of the way (with the final third almost upon us) toward demonstrating that turning the brief Hobbit book into three long films was not artistically warranted. And it's not even like the so-far enthralling Hunger Games films needed any help. It's just that this might be the best possible beginning of the ending that this particular story could have. The Games are done here. No more playing. Katniss Everdeen (Jennifer Lawrence), reluctant heroine of District 12, has been snatched from the arena where impoverished teenagers play out a to-the-death blood sport for the amusement of their overlords of the decadent Capitol. In that arena, she accidentally inspired a nation of downtrodden serfs in the future North American nation of Panem to begin to tentatively rise up. Now, she is among her rescuers, the people of the lone outright rebellious District, 13, the leaders of which hope to use her as a symbol to ignite all-out civil war. From the beginning, the series has been about the power of propaganda and the persuasive capabilities of media to tell a story that will sway hearts and minds. With Mockingjay 1, the films continue on their astonishing track of being, if not actually better than, at least more complementary to the novels than perhaps any movies based on books have ever been. That's because the books are told from Katniss' first-person, present-tense perspective, which has its own intimate weight but fails to offer us a larger view of her world. In the films, we are shown from outside her head how Katniss is used by others to further their own agendas, and that cultural impact in her world. 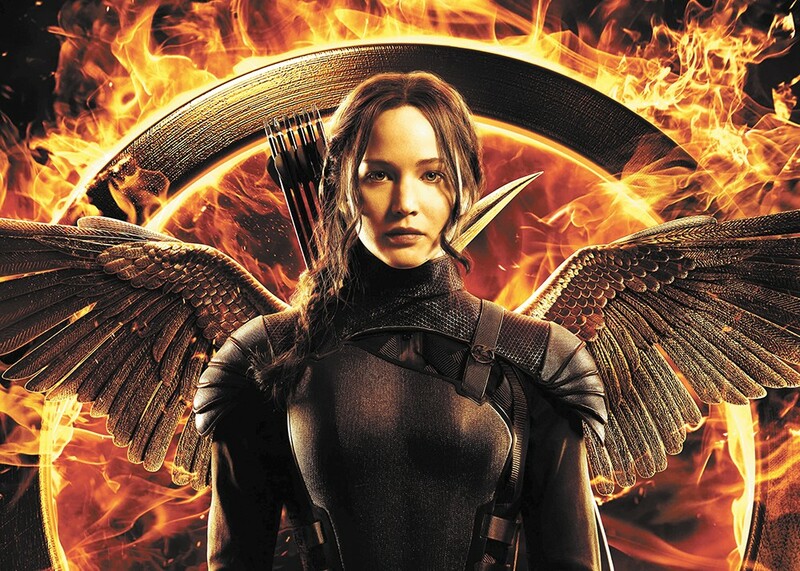 The extraordinary thing about Mockingjay 1? Now, it's not the rapacious Capitol and evil President Snow (Donald Sutherland) offering up Katniss as a public inspiration but the leaders of District 13, including President Alma Coin (Julianne Moore) and former Gamesmaker Plutarch Heavensbee (Philip Seymour Hoffman), who has defected. Katniss (and we) may agree with their aims of overthrowing the Capitol, but it's startling and a bit horrifying to see how very moving propaganda can be. A terrific sequence early in the film illustrates this and shows off Lawrence as a remarkable actor. We saw in the previous films how Katniss was good at pretending to be something she was not (such as "hopelessly in love with Peeta," her Hunger Games teammate). Here we see how absolutely awful she is at trying to force herself to show emotion that she intellectually agrees with, but isn't feeling at the moment. She's completely unconvincing shouting lines scripted for her by Heavensbee about freedom and rebellion in a studio setting... but once another Capitol defector, director Cressida (Natalie Dormer) gets her out in the field to tour another District devastated by Capitol bombing and visit with the wounded, Katniss' ire is genuinely raised. There's a lot of complicated and even intriguingly contradictory stuff going on here: the triumph of a young woman who cannot be managed yet soars when she gets to be herself raised a huge lump in my throat; at the same time, I was fully aware that her powerful rage was being turned into a product. The Hunger Games: Mockingjay, Part 1 is not showing in any theaters in the area.